Camping can be great summer fun. Before pitching your tent, take the time to read these tips to keep you safe and prevent injuries. Pitch your tent at least 4.6 metres (15 feet) upwind from grills and fire pits to avoid your tent catching on fire. Heat or flame producing appliances should never be used inside or close to a tent. Maintain at least a 1 metre (3 feet) clear area free of leaves, dry grass, pine needles around grills, fireplaces and tents. Be careful not to spill any flammable fluid on your clothing or in the area surrounding the grill. Don’t use a flammable fluid to start a fire. This can cause an explosion. 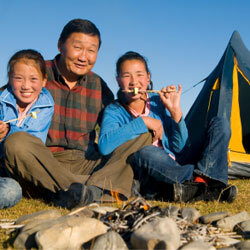 Don’t wear loose clothing, sandals or open-toed shoes around a campfire. Always be sure to put out a fire with lots of water, on and around the fire and coals before you go to bed or when you leave the campsite. Make sure that sticks are long enough when roasting marshmallows to avoid leaning into the fire.